The Cohiba Maduro 5 Magicos is a strong yet creamy Petit Robusto, of 52 ring gauge, 4.2” (115mm) long and comes in a box of 25 cigars. 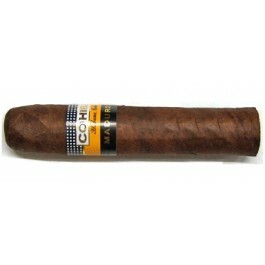 Another beauty from Cohiba, providing rich woody, leathery and coffee flavors. Its wrapper is beautiful, dark brown, because it was aged for 5 years and its construction is impeccable. The Cohiba Maduro 5 Magicos is a very unique cigar that is part of the Maduro series from Cohiba. •	Very tasty cigar, lots of creamy flavors, and a wide range of beautiful aromas. Some woody, earthy, herbal flavors. •	Never overpowering, it is a delight. Its perfect construction allows it to age very well. This cigar is a great Cohiba experience, which truly celebrates what Habanos are all about. The Cohiba Maduro 5 Magicos is using a darker wrapper, mark of an aged wrapper. It looks superb, without any flaws, and it is incredibly smooth and silky. The cigar is pretty short and fat, but looks amazing. The rolling seems perfect, almost no veins visible. It is pretty firm to the touch from the head to the foot. The triple cap is almost blending in with the wrapper. The Maduro 5 Magicos sports the usual Cohiba band and an additional black band with MADURO 5 printed in gold letters. The wrapper smells of dry tobacco and hay. There are also notes of cocoa, wood and cinnamon. Once cut, the pre-light draw gives some wood, sweet cinnamon, wood, hay and hints of graham cracker. The draw is a bit too open, and lighting the cigar is easy. The draw corrects itself during the first third, and the cigar keeps burning slow and without getting too hot throughout the whole cigar. The burn line is good and does not need any touch up. The first few draws are not too powerful, and each draw generates an ample amount of smoke. The light gray ash holds on very well, up to almost two inches. The very first draws reveal some wood, coffee and salty leather flavors. The first third of the cigar is dominated by lots of smoky wood, leather. Each draw is amazing in revealing more flavors. There are also notes of cocoa, nuts, black licorice and earthy mushrooms. There is just enough spice. The retrohale has some cedar profile. The finish is long, very creamy with some black pepper staying on the palate. Overall, the first third is very creamy, almost syrupy. The strength is in the mild to medium category. In the middle third, the strength of the cigar picks up just a bit, now a medium bodied cigar, in the same time the flavors are also getting stronger and bolder. There is still plenty of wood, dark espresso, spices while the chocolate notes faded to the background after the halfway mark. The finish is very creamy, with hints of salty nut. There are also notes of salty leather and sweet tobacco. The flavors are very well balanced and they mix beautifully together. The cigar is now producing an ample amount of smoke, while the ash holds on very strongly which shows the perfect construction of the cigar. In the final third, the strength of the cigar goes up one more notch, and is felt on the back of the throat alongside with a good amount of spices. The flavors in the foreground are much more on the earthy tone than in the second third. There is dry earth, truffle, earthy tobacco and some mineral notes. The creaminess of the cigar is dropping on the background, and leaving more space to rich wood and coffee; there are also notes of leather, salty peanut, and chocolate. The finish is now shorter, with some wood notes, and roasted coffee beans. The smoke remains fairly cool throughout the whole cigar and still produces ample amount of smoke clouds. In summary, this cigar is a real gem. Of course it is not an everyday cigar, but if you are looking to celebrate something, don’t look any further.